Reconstruction is perhaps the best option for stopping a leak. However, it's also the most expensive. The pond must be drained and the basin sealed or the dam repaired. If you're considering this option, contact your local Soil Conservation Service, an engineer or a qualified contractor with pond building experience for more information about the feasibility and cost. Sodium bentonite is another option for stopping a leak. It is perhaps the best option and the most cost effective method of treating porous soil. 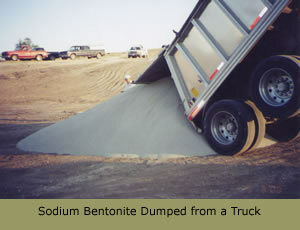 Sodium bentonite swells 15 to 18 times its original volume when placed in water. Mixed blanket, pure blanket and sprinkle are the three main methods for sealing a pond with sodium bentonite. Texas Sodium Bentonite produces an "All Natural Product," (no chemicals added), environmentally safe and will not harm fish, livestock, wildlife or birds. Plastic, vinyl or butyl rubber lines are available for ponds with severe leaks. This method is very expensive and will not work in all situations. Water pressure under the liner can force it away from the bottom, if the pond is spring fed or is located in an area with a high water table. Muskrats and other burrowing animals, as well as livestock, will also puncture the liner. Liners must be replaced every few years. Soil with high percentages of clay may be spread over the entire pond basin to stop leaks. The pond basin should be drained and disced to a depth of 8 to 10 inches. Clay can then be applied to the surface and compacted. This method may be less expensive than bentonite, however, the clay blanket may need to be as deep as 12 inches in addition to the high clay percentage already in the soil to prevent seepage. This method will not work as well on soils with low to moderate percentages of clay. Turning the pond basin into a hog-wallow for a time can seal some leaks. This method, however is not recommended, because the excessive nutrients placed in the pond basin by livestock can cause excess aquatic growth and may make the water unfit for fish, livestock and human consumption.